The theme of Laboratory Quality in Challenging Times seemed to be appropriate. While the reality of medical laboratories for the past twenty-five plus years, seems that it is always challenging, we seem to be reaching a capstone point with shrinking resources, fewer (and aging) staff, increasing customer expectations and demands, new sources of competition, and disruptor technologies. Laboratory life is becoming a perpetual "Advil" moment. On a more positive note, we are seeing new and thriving signs of inspiration and initiative and innovation. The conference was attended by around 80 participants including students from the university and provincial institute of technology. While most attendees were from my home province, there were also laboratorians from across Canada and from the United States. Its good to have a base, but I will continue to push for a broader audience. For a Canadian conference on Quality I was very satisfied with the audience size. 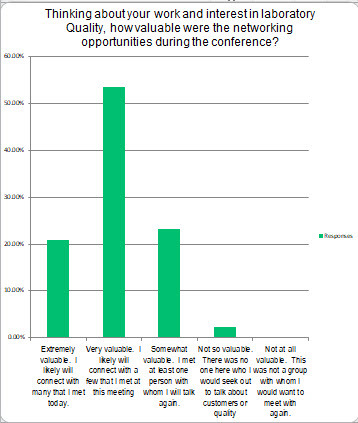 It created a great opportunity for both individual and group participation in a way that larger conferences can't offer. 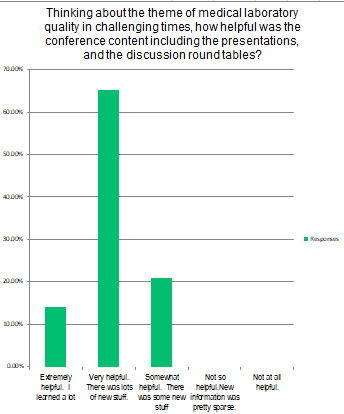 One example: After each themed section with two or three speakers, there was a round-table discussion in which the audience, speakers, and moderators could discuss, challenge and debate for 20-30 minutes. It was an energizing participatory exercise that created as many sparks as the presentations themselves. Tough to do that with an audience of 500 or more..
A coterie of excellent speakers from our department, from across Canada and international spoke to the theme of Laboratory Quality in Challenging Times, touching on topics including Patient-Centred Care, Laboratory Leadership, Improvement, Evolution of International Standardization, “Take-Away Tools”, Quality Initiatives, and the Opportunities for Quality Specialists. Speaking to the collaborative program between POLQM and the International Training and Education Center for Health (I-TECH), currently in conjunction with the American International Health Alliance, and the Ministry of Health Zambia, Dr. Lucy Perrone, University of Washington and Directory of I-TECH Laboratory Strengthening Program spoke of the International Opportunities in Quality and Dr. Michael Noble spoke to training in Quality through the Program Office’s on-line Continuing Professional Development course. 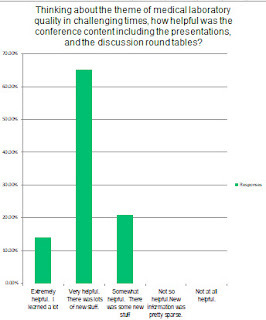 We were not surprised, but were still pleased to see that the participants scored the conference for its content. It was clear that we hit all the relevant key-points for a Quality conference. In the on-line satisfaction survey, responses were received from more than 50 percent of the participants. Significantly and consistent with human-sized conferences the conferences was rated highly for networking opportunities. Overall, the conference was rated at an impressive average score of 86/100 (median score 89 and mode score 90). Planning for our next October Quality Conference (2018) will be starting soon.